It's love at first fright when Casper Meets Wendy in this live-action adventure featuring an all-star cast, amazing special effects and spook-tacular fun for the whole family. When evil warlock Desmond Spellman (George Hamilton) vows to destroy Wendy, the Good Little Witch (Hilary Duff), she and her witless witch aunts (Cathy Moriarty, Shelley Duvall, Teri Garr) hide out at Sunny Brite Resort, where the vacationing Ghostly Trio has been..
Hooky Spooky. From the original 1950's animation, Casper reigns supreme in these rare theatrical technicolor cartoon shorts. 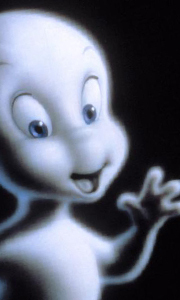 Never has there been a friendlier ghost than Casper, and now these charming cartoons are here for a whole new generation of fans! Watch Casper & Friends have all kinds of fun and spooky adventures! Includes The Following Episodes: Hooky Spooky Which Is Witch Boo Ribbon Winner..
Casper "Ghost therapist" Dr. James Harvey (Bill Pullman) and his daughter Kat (Christina Ricci) arrive at drafty Whipstaff Manor. Its greedy owner Carrigan Crittendon (Moriarty), has hired Dr. Harvey to exorcise the house's apparitions: a friendly ghost named Casper and his uncles Stretch, Stinkie and Fatso (The Ghostly Trio) who will not tolerate "fleshies" in their house. Casper & Friends Hooky Spooky Never has there been a friendl..
From director Brad Silberling and Steven Spielberg's Amblin Entertainment comes a live action fun house ride filled with laughter, excitement and ghostly surprises. "Ghost therapist" Dr. James Harvey (Bill Pullman) and his daughter Kat (Christina Ricci) arrive at drafty, old Whipstaff Manor. Its greedy owner, Carrigan Crittendon (Cathy Moriarty), has hired Dr. Harvey to exorcise the house's apparitions: a friendly but lonely young ghost.. Prepare for some high-spirited fun as Casper and his friends haunt their way through seven spooktacular episodes. Episodes Three Ghosts And A Baby Leave It To Casper Spooking Bee Fugedaboudit The Flew Paws Alphabet Song / Is So Too..
For ghosts, werewolves, vampires, zombies, and other creatures of the night, anything goes... except making friends with humans! When Caspar, the world's friendliest ghost, befriends a human kid, his uncles decide to send him off to the one place in the world (or the underworld) that can cure him of his friendliness once and for all: Scare School. Scare Day Episodes: Fang Decay Scare Day Disarmed & Dangerous Frankenleftovers Bully For ..
For ghosts, werewolves, vampires, zombies, and other creatures of the night, anything goes…except making friends with humans! When Casper, the world's friendliest ghost, befriends a human kid, his uncles decide to send him off to the one place in the world (or the underworld) that can cure him of his friendliness once and for all: Scare School. 8 Spooky Episodes Fang Decay Scare Day Disarmed & Dangerous Frankenleftovers Bully For You T..